At Scientific Sales, The Model 61302 is one of our barometric pressure sensors that offers unparalleled performance and flexibility for atmospheric pressure measurement. The barometer is available in two configurations to satisfy a variety of applications; Model 61302V offers 0-5 VDC output,61302L offers a 4-20 mA current output. These barometers for sale offer serial output in addition to the analog signal. For outdoor installation of the barometric pressure sensors, Model 61360 Weatherproof Enclosure and Model 61002 Pressure Port are recommended. 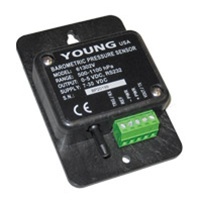 Contact us for more information on barometric pressure sensors and other barometers for sale!